(LEFT) Image of Dante Robinson, 17, taken from Twitter. (RIGHT) Image of Justin Robinson, 15, taken from Facebook. Dante Robinson, initially charged in the death of Autumn Pasquale, was released from a youth correctional facility Tuesday, according to sources close to the case. In afternoon court proceedings, Dante, of Clayton, pleaded to fourth-degree obstruction in Family Division Superior Court Judge Colleen Maier’s courtroom. The teen, who has been in the Camden County Youth Correction Facility since last fall, was sentenced to six months in jail and released with time served, according to a confidential source. Anita Saunders, Dante’s mother, was at home Tuesday night inside the East Clayton Avenue home where police claim 12-year-old Autumn was murdered. The family would not say if Dante was inside the house. Dante and his brother Justin Robinson were 17 and 15 last October when arrested and charged in juvenile court with the girl’s killing. 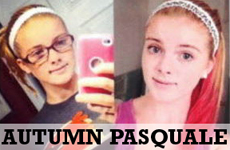 Autumn’s disappearance in late October prompted a massive days-long search through Clayton and surrounding communities. Two days after she went missing, her remains were found in a blue recycling bin on an abandoned property next door to the Robinsons’ East Clayton Avenue home. The brothers were charged in her death. Last month Justin Robinson, now 16, pleaded guilty to aggravated manslaughter after taking sole responsibility for luring the pre-teen to his house and strangling her. He was sentenced on Sept. 12 to serve 17 years in state prison of which 85 percent, or about 14 years, must be served before he is eligible for parole. Tuesday night the borough was quiet. The Pasquales’ West High Street home, where Autumn was last seen on Oct. 20, was dark. Autumn’s father Anthony Pasquale would not comment on Dante’s release. “Mr. Pasquale respects the court’s order,” said Doug Long, Anthony Pasquale’s attorney who would not make additional comments about the obstruction plea or Dante’s release.